This B&H Kit features the FREEFLY MoVI XL Motorized Stabilizer and the FLOWCINE Black Arm Complete Dampening System, which enables optimal vehicle-mounted use of the MoVI. The Black Arm Complete features a vibration mount for stabilizing roll and tilt errors as well as vertical motion and vibrations. The MoVI XL supports up to 50 lb payloads while the Black Arm Complete supports up to 70 lb loads (the MoVI weighs 34 lb with batteries). Capture super-stabilized gimbal shots from your car, ATV, boat, snowmobile, or other vehicle with the Black Arm Complete from FLOWCINE. Purely mechanical, this three-axis dampening and vibration-reduction system hard-mounts your gimbal-and-camera setup to your vehicle, stabilizing roll and tilt as well as vertical motion and vibration. The Black Arm's design incorporates a four-spring arm with fully adjustable actuator hydraulic dampers and a platform that levels the separately available gimbal. In addition, between the arm and the mounted gimbal there is an anti-vibration Tranquilizer mount capable of handling loads between 14.8 and 49.6 lb. Mounting the Black Arm is as simple as clamping it onto a standard 48-52mm speed rail. The damping action of all three axes—vertical, tilt, and roll—is brought about by the hydraulic dampers. A 22-step knob enables you to precisely dial in the amount of damping you need for your shot. The Black Arm Complete ships with two dampers for each of the three axes. Also included is an extra-sturdy, wheeled all-black pro case with powder-coated metal corners, butterfly catches, and heavy-duty recessed handles. 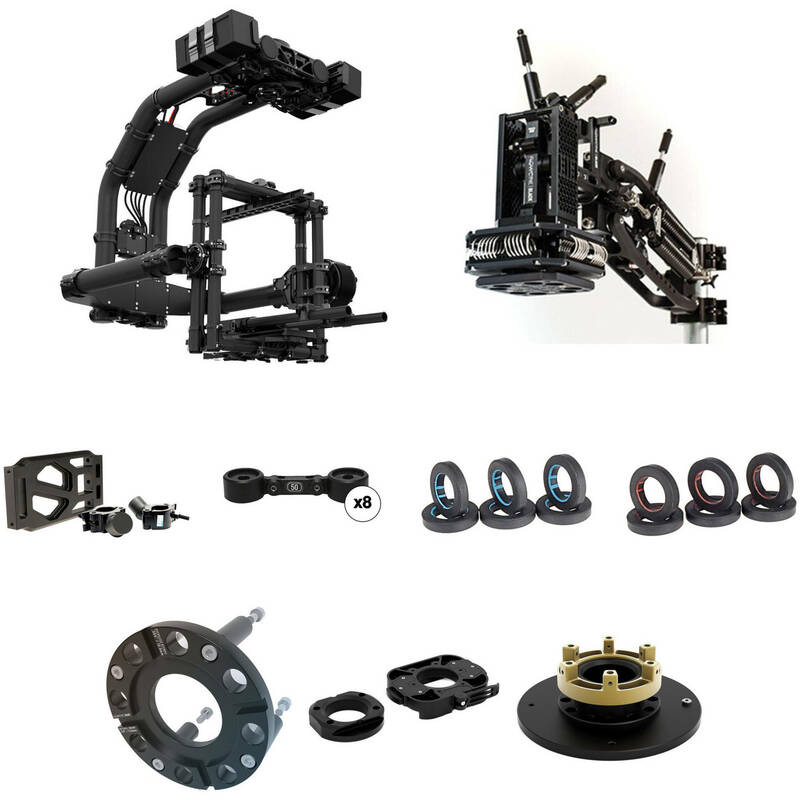 MoVI XL features a 6 bolt pattern allowing users to mount the gimbal to a variety of devices. The MoVI XL to Mitchell Adapter adapts the 6 bolt pattern to a standard Mitchell Mount. This can be used with or without the MoVI XL quick release. Freefly sets gimbals up to use the Quick Release system as it allows for much faster changeover than bolted or Mitchell mount. Box Dimensions (LxWxH) 16.8 x 10.4 x 6.6"
Box Dimensions (LxWxH) 32.0 x 25.0 x 17.5"
Box Dimensions (LxWxH) 5.5 x 3.0 x 0.75"
Box Dimensions (LxWxH) 6.05 x 4.6 x 2.05"
Box Dimensions (LxWxH) 5.1 x 4.0 x 1.9"
Box Dimensions (LxWxH) 9.7 x 7.5 x 3.1"
Box Dimensions (LxWxH) 9.1 x 8.9 x 2.9"